I've found this cool way of reinventing your curtains! Did you already had that problem before losing some of your curtain hooks? If this happens to you, chances are you will definitely purchase a new set as it is not likely that you will use different designs of hooks for your curtains. But guess what? 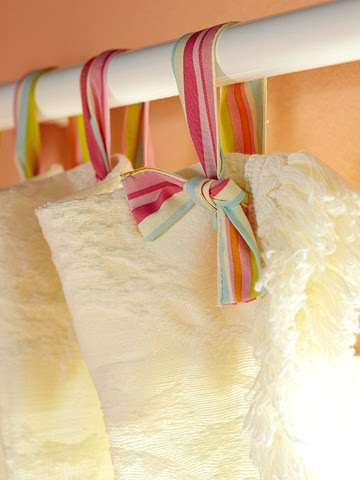 Cute colorful ribbons could be a substitute for hooks and will definitely add life to your curtains. All you have to do is to choose a color that would give a nice contrast to the color of your curtains. The lenght of the ribbon can be adjusted based from your own personal preference. This is an easy and cheaper alternative to revive those old curtains and give your home a "fresh look".